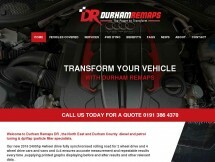 Just had my 3rd car mapped and serviced by Durham Remaps. Great service and the car is once again transformed with the bonus of better mpg. I chose to get the engine BG cleaned also which improves performance and should be a standard part of servicing every diesel car Cheers Ian. Pleasure to see you again and thanks again for making my girlfriends car the car it should have been in the first place ??? ?